"Having real data from a majority of the solar plants in the United States will help people make proper comparisons and informed decisions," lead author Sean Ong said. The report, "Land-use Requirements for Solar Power Plants in the United States,"PDF was written with NREL colleagues Clinton Campbell, Robert Margolis, Paul Denholm and Garvin Heath. By the third quarter of 2012, the United States had deployed more than 2.1 gigawatts of utility-scale solar generation capacity. Another 4.6 gigawatts was under construction. There has been a long-running debate over the comparative land needs for various forms of energy, old and new. But that's not the purpose of the new report, Ong and Denholm emphasized. "The numbers aren't good news or bad news," Denholm said. "It's just that there was not an understanding of actual land-use requirements before this work. However, we were happy to find out that many of the solar land use ranges and estimates used in the literature are very close to actual solar land use requirements that we found." 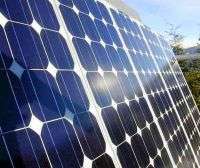 A previous NREL report, "Land-use Requirements and the Per-capita Solar Footprint for Photovoltaic Generation in the United States," had estimated that if solar energy was to meet 100% of all electricity demand in the United States, it would take up 0.6% of the total area in the United States. "All these land use numbers are being thrown around, but there has been nothing concrete," Ong said. "Now people will actually have numbers to cite when they conduct analyses and publish reports." NREL previously had released a report on land-use needs for wind power. Doing the same other generation resources including coal, natural gas and nuclear—estimating land use via huge sample sizes—would help inform decisions, Denholm said. The report provides fundamental data that can be used to understand the impacts and benefits of solar. "Modelers and analysts, people looking 10 or 20 years into the future can use this report to evaluate the impacts solar energy may have," Denholm said. For those who are not comfortable with these units, I've just checked on wikipedia: one acre is about 4,046 square-meters. Multiply this by 32 and divide by 1000 that makes an average of about 130 square meter per home. That's the area of a square of bit less than 12 meters for each side. The required generation area is less than the roof area of 1000 houses where PV panels or PV tiles would be located. That makes the solar panel solution viable with no additional land use. Would that be DOE Solyndra or DOE SunShot Solar Panels ? Don't believe everything DOE puts in print. Self Serving facts. Concentrating Solar plants only require 2.7 acres per gigawatt. That isn't bad at all. Its comparable to a coal fire plant, where acre after acre is covered in coal mountains. I'm not to surprised about solar PVs. It does depend significantly on the efficiencies of the panels. Personally I like solar on the roof top, which is just a waste of space anyway. Why not make use of that. We already have a huge supply of solar energy buried safely below the water table, and when fracking releases it in storable form to be burned, photosynthetic plants thrive on it too. The near trillion tax dollars wasted on premature alternative energy schemes would alone have paid off all the student loan debt of our generation. Instead, Al Gore and other insiders are smoking Cuban cigars in sugar daddy heaven. It's not 2.7 acres for a GW, but for a GWh per year. Meaning a 2.7 acre plant can produce 1 GWh in a year. There's 8765 hours in a year, meaning it produces on average around 114kW. Given maintenance stops and such, when it's productive it actually produces a bit more. If you put this in hot climes with sunny weather, the panels could be mounted on the homes (as mentioned) and if offset from the actual roof can provide shading for the roof that will reduce the cooling needs of the home by that much more. It does sound like it might be feasible, with the right technology, to partially power a lot of homes with mounted solar panels. The hitch is a lack of energy storage for daytime generated power. Friends who have done it, unless they stay home all day, don't see the benefit that much from reduced AC bills because they program the AC to be off during most of the day (nobody is there). Unless we develop capacitors or energy storage, this technology is unfortunately of limited replacement capacity. Economic will change Druid. When the only expense is the initial capital and infrastructure/maintenance there after, what is not to like about solar. I doubt government would allow such a rapid inflation of energy prices, nor would it be acceptable business practice nor a good business model. No Ducklet, your wrong too. You get 1364 Kw / m^2 typically for solar input. 4046 m^s/acre gives 5.52 Gw/acre. 1/2 the day is active, so you get 2.759 Gw/acre, theoretical of course. Backup, its 1364 Watts/m^2, so divide everything by 1000. It's 2.7Mwatts/m^2 per acre. Sorry false alarm. Still 2.7Mwatts is respectable for 1 acre of land and still compatible to coal plant acreage. The big difference is this can be roof mounted, and decentralized and always CO2 free, pollution free, hassle free, and profitable. cost per kilowatt is what matters. You mean as opposed to the 72ct per kWh subsidies nuclear got in the first years? Why does it not occur to anyone to build solar power plants vertically? The area of the radiation front of the sun covered by the Earth is well defined. This gives you the amount of energy per square meter (solar constant) which is directly dependent on the latitude (and time of day). Ever see a leaf? They're horizontal. And for good reason. Going vertical allows you to cover more ground, without actually covering more ground. Think about the shadow of a vertical structure. Doesn't it cover more ground than its physical footprint? No it does not. It allows you to cover more volume. But solar radiation is a function of area, not volume (as you're collecting photons streaming through a surface). If you cover the same area with a larger volume of PV cells then you've just reduced the amount of sunshine per PV cell. Yes , and it's first-year-physics wrong. This is so wrong you can't get any more wrong. The annual energy output figures per acre, 0.26 to 0.36 GWh / acre, demonstrate the inefficient land use of centralized solar compared to roof-top solar. For example, consider the PV Watts numbers for St. Louis. A flat surface would receive 6.25 GWh / acre / yr. Even with pedestrian 15% efficient PV solar cells and allowing a 25% energy loss for inverters, wiring, dirt, bird dropping and round-trip storage loss, the output would be 0.70 GWh / acre, compared to 0.36 GWh / acre for centralized tilted PV. The average size of the lot of a singe family home is about 100 by 130 feet, so you need about 300 acres for 1,000 homes. That's only a little less than ten times the lot size of that occupied by your solar energy source. That's one way of thinking about whether this concept is practical. Take the roof surface area of mean home footprint (single or two-story), figure about half of that as useful/facing the sun most of the day. You'd still probably come out ahead of the plant in acreage. You all forgot to factor in the cost, efficiency and area of the required grid energy storage systems, because sunshine isn't steady all day, all year long for most of the inhabited world. Energy storage with batteries still pumps the price of electricity to the order of 50 cents to a dollar per kWh when you factor in the cost and useful life of the batteries on top, and other means of storing energy are often much less efficient and take large areas of land (and water), such as pumped hydro storage. The issue is that in order to truly generate all the power you need, you have to produce extra and store it for days to account for the occasional rainy day, and for months to account for the seasonal variation in output and demand. You can't just build a thousand homes worth of solar energy and pretend that it's powering these homes, when in reality the homes are still utterly dependent on conventional power such as oil, gas and nuclear. The average US house has a roof area of 250 square meters(2700 square feet) and more than 2 inhabitants. Some of this is invariably in the shade or tilted away from the sun, and most panels deal VERY poorly with partial shading(shading a few percent of the panel reduces output for the entire panel to near zero. You get this power only at daytime, with a maximum around noon, when power consumption for a house is at a minimum(kids at school, adults at work). You get far more power than you need, when you don't need it, and little or no power when you do. Without storage, this is nearly useless. Ontop of this, roughly 2/3 to 3/4 of your electricity consumption is indirect and embedded in goods and services. Ontop of that, ~80% of energy consumption is not electricity. your $250 heating bill this winter wil run you over $750. That is not the cost of solar in Germany. That is the cost of retail electricity in Germany and their high cost is not due to renewables. Germany is installing solar at an average of $2/watt. At a miserable 11% capacity that works out to about 12c/kWh. Roughly 75% of roof area faces east, south or west. East- or west-facing panels produce ~80% as much power as south-facing panels. And they extend the solar day. Electricity produced during the day offsets dispatchable generation (hydro, natural gas) and stored power, leaving it for consumption after the Sun sets. Yes final costs include a lot of additional costs like transport costs (monopole companies) and then the providers (again country monopole or at least regional monopole) plus excise taxes on energy (fuel, gas, electricity) which can be in some cases very high. Best case scenario, the state manages to control these entities that provide us the energy, worse case scenario these entities manage to fully corrupt the governments and squeeze the population due to monopole. with DC power loads like ECM motors, LED lights, electricity use can be cut in half and you will not need an inverter for solar cells. This technology is available today no telling what we will have soon. This article will be ancient history soon. On a vertical arrangement of panels, the apparent size of an object gets smaller with increasing distance, so the vertical distance between panels can make a difference. The angular diameter of the sun remains constant. But depending on the latitude and season, the sun's never at the zenith for very long during the day anyway. On the efficacy of a vertical arrangement, as an aid to steadying and keeping aloft the first twenty miles of cable for a space elevator, for instance, vertical is pretty much the way to go. You obviously aren't getting it. By going vertical, you are not necessarily covering the same area with a larger volume of PV cells. Rather you are covering a larger area with the same amount of PV cells you would if you laid them horizontally. You are forgetting about the angle of the sun to the horizontal surface of the earth. Try an experiment: Raise your hand on a summer day, notice the shadow under your hand? Now, raise your other hand to ajoin the first, notice the adjoining shadow? Now lower one hand while keeping the shadows adjoined. What happens? Does the lowered hand not either slide under, or away from, the other hand in horizontal distance? Orient yourself and choose the direction where it slides under. Now you've built a vertical structure that covers twice the area of its standing footprint. A tower which can actually adjust its lean, with movable PV "leaves," would be the most efficeint design (think; sunflower stem and leaves). And think about this: Why do many plants grow tall? Rather you are covering a larger area with the same amount of PV cells you would if you laid them horizontally. No. You're covering the same INCIDENT area of solar radiation. Each panel, when oriented vertically is getting less sunlight. The sumtotal of incident irradiated area - which determines how much energy you can gather - is the area perpendicular to the rays of the sun. This is COMPLETELY independent of how you arrange your solar cells. The best is to have them facing the sun - which means you need least amount of PV cells to gather all photons. This is why some solar arrays are mounted on swivel mounts (and also why flowers follow the sun over the course of a day) - though the cost of swivel mounts doesn't seem to be worth it when considering cost vs gain. Why do many plants grow tall? Because they are in a race with neighboring plants. If they don't then these will put out leaves that shadow them. C'mon. This is basic, basic stuff. Shape up. Where did I state the PV cells themselves must be in a vertical configuration? Think about horizontal window blinds and how they are stacked vertically. I disagree. Cheap, passive systems that automatically follow the sun are possible. How is this an advantage, when you've stated this arrangement is less efficient than a flat, horizontal layout? How can the taller plant overshadow the smaller plants, if their shadow footprint supposedly can't be larger than their physical footprint? Why aren't you getting this? Cheap, passive systems that automatically follow the sun are possible. And in the end: Plastering the field you have with 100% with solar cells will give you the maximum amount of energy possible. Orienting some of these will not get you a nanowatt more of energy. I repeat: plants compete with one another. If one plant were to go for an (energetic) optimal flat horizontal layout then another plant would simply start off investing some energy (suboptimal) to gain some height and then put out leaves as vertically as possible - which would kill the first plant since it wouldn't get any more sunlight. The USA has extreme temperatures, so aerogel insulation should save a lot of energy. I've also found the light of GP LED spots adequate at 90% less energy use than halogen.